A couple years ago – 2014 I think – I had a regency romance come out. The title was Queen. And the funniest thing happened. When I went to Amazon and searched for “Heather Gray Queen” I did not find my book. Instead, I found a boatload of bedding. It was all queen-sized, of course. 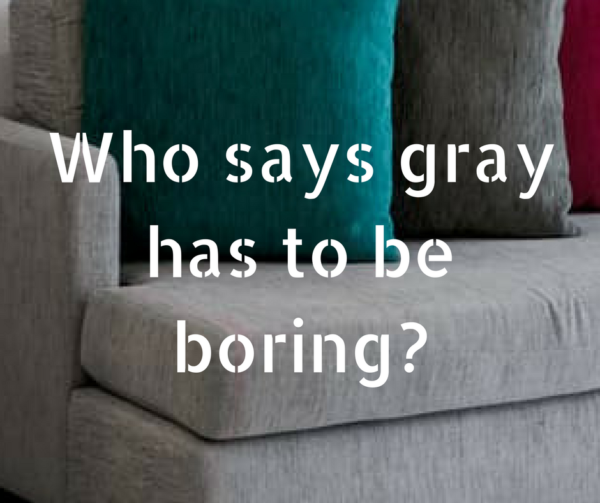 And the color was…yeah, heather gray. The funny thing is that, when I’m choosing book titles, I often go to Amazon or Goodreads and look to see how many other books have that same title. Queen was a safe one. There weren’t a million other books by that name. Queen, along with my name, though, was completely lost as a book. In fact, one reader messaged me to tell me I hadn’t written a book – I’d written a bed set instead. There are some fundamental differences between men and women. This is one of them. Women see a color, like the color, and learn the name of the color. Men see a color, might or might not have an opinion about the color, and never bother to learn the name of the color. At least that’s been my experience. So as I explained to my husband that my name – Heather Gray – is indeed a color, I got this idea for a series…and Rainbow Falls was born. Now fast-forward a few years. Why so long? I had other writing commitments that I needed to keep, and this series idea needed time to percolate. We (the series and I) are both better off for the wait. Anyway…Skye’s is the first book in the Rainbow Falls series. Can you guess her last name? Skye Blue is the unwilling owner and CEO of a company she never wanted to inherit. She’s running from her responsibilities, from memories that haunt her, and from what she sees as her greatest failing in life. And who should she meet while she’s on the run? A man who – sort of – works with runaways. Sam Madison is a former Marine with battle scars, tattoos, and a heart for serving God. He ends up in the seat next to Skye as she flees to Rainbow Falls. Sam started a homeless shelter for military vets, men who are often running away from themselves while battling their own demons. There’s no way the woman sitting next to him is a vet, but her eyes carry the same shadows as so many of the men he works with at Samaritan’s Reach. Sam looks like he’d be more at home in a prison yard than on an airplane headed to Rainbow Falls. Skye, who battles anxiety and fear on a daily basis, struggles to find the courage to look past his exterior to the loving heart within. How will God use the town of Rainbow Falls to touch the hearts of two mismatched people who need each other more than either of them realizes? 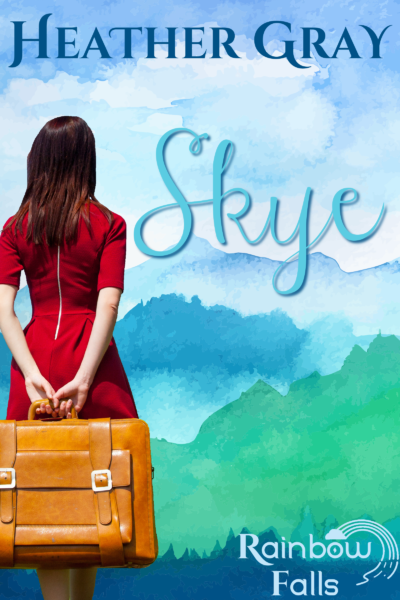 I’ll be sure to let you know when Skye is available for purchase in the spring. In the meantime, let’s have a giveaway! One winner will receive a $5 Amazon gift card. To enter, comment below and tell me what your favorite color is and why. Looking forward to the new series- how fun, colour names:) It sounds like some serious themes will be tackled which is great. I love blue- I find it restful and it matches my eyes so I love wearing blue clothes. Hi Heather! Delightful blog on what is to be another gloomy drizzly day in SW Michigan. I love the name Heather, which makes me think of Lueneburg Heath in Germany with its field of wildflowers. My favorite color is lavender or lilac (love the flowers). Softer in color than purple. Looking forward to reading Rainbow Falls romances. One idea for a story, especially the color red or green, is to have a suitor who is color blind. Usually only men are color blind. The gene is carried by the mother (just like baldness). Very few women are color blind, but one of my friends is. Now a funny story. On one of my first dates with my husband of 44 years, he said, “Look at those two cars parked next to each other – same color.” Really, it was seven in the morning and the sun was glaring, I thought I was seeing things. So I looked again and finally said “Nope, NOT the same color – one is red and one is copper.” So he told me he was color blind. Usually not something a guy admits at the beginning of a relationship. Thanks for taking the time to share, not only info on your next series, but your writing process. As a retired English and creative writing teacher, I know writing is hard work. Takes time and dedication. Thanks for your commitment to your craft. You are inspirational. Hi Heather! Great post! “In fact, one reader messaged me to tell me I hadn’t written a book – I’d written a bed set instead.” This made me laugh. I look forward to reading the Rainbow Falls series. It’s hard for me to pick one favorite color, but probably green because it reminds me of spring. I was very glad I didn’t have a mouthful myself when I got there. LOL! I enjoyed the story, Heather. Enjoyed reading your post. Sounds like the series is going to be quite interesting and colorful. Amusing tale, and sounds like a lovely start to the series. Rainbow Falls sound like a wonderful series. I’m looking forward to the release of Skye. I used to love everything blue when I was a teen… then I’ve got a glimpse of red and been in love ever since. (Even had a red car in college.) Being a blonde, red and I get along pretty well. Your tomato comment reminded me of my high school uniform. School colors were dark red and dark yellow, so the uniform was a combination of those shades which of course prompted other schools’ students to labels us “ketchup and mustard.” Eventually the school changed the uniform to (boring) gray even though the school colors are still the same. I guess they heard about bullying… (i do appreciate gray now more than in school because I ended up wearing gray for my entire school life, which can be quite boring for a kid). Fortunately (or not), we didn’t have a mascot. So no worries there. It was a small high school and we focused a lot on basic academics and not much on sports and arts (though I was part of the volleyball team, but we mostly played friendly games). I can identify with your point about colors and husbands. When my Prince Charming and I were dating, I asked him what his favorite color was and (after much thought) he said, “netural.” He didn’t know what it meant; he just heard the term on some TV show when he was flipping channels one day. I, on the other hand, have always had a favorite color: blue, because who hasn’t stood on a beach or pier, and looked out to where the water meets the sky and thought, “Wow!”? Ha! What a hoot! I used to say – years ago – that my favorite color was white, and I’d explain it by saying that when something’s white, you can color it any color you want. It’s a blank canvas, and the possibilities are limitless. Eventually, my philosophical answer got too long-winded, though, and I switched to just saying that I don’t have a favorite color. It’s easier that way. But your Prince Charming’s answer – how funny! At least he gave it some thought before answering, right? ^_^ And as for blue – I love, love, love your reason for it being your favorite. I was describing a shade of blue to someone recently, and I explained is as “blue like the sky that’s over the ocean in the early afternoon.” There’s just something about the ocean and the sky – the colors are brighter, more vibrant, full of layers and life and the endlessness of God. Have a name suggestion for you Lily White. Anywho my favorite color is Purple, all shades really not sure why, I just love it. My hair is even purple right now. Pink is my favorite color. Has been since 2011 when I was diagnosed with breast cancer. But thankful to God that I’m a survivor! Pink is a good color for a million different reasons, and yours is definitely one of them! God is so good! Thanks for the excerpt! I’m looking forward to reading this series :) My favorite color – definitely Blue! I appreciate all the time you put into your writing and I enjoy reading you finished product. I’m glad you could stop by today Julianne – and thank you for the kind words! Blue is a great color. It can be peaceful, bold, and so many other things all at the same time. To the annoyance of my young granddaughters, I don’t have a favorite color. I love green, blue, purple, and pink… as my wardrobe will attest! About the only place I like yellow is sunshine and daffodils, and I really like it there A LOT! Heather this new series sounds really fun and interesting! I love all the color references. Great choice in words. I can’t wait until it comes out! Heather, I have a hard time picking out a favorite color. I think it depends on my mood. Your series sound interesting. I loved the story about your name being a color. You’re so right! Colors reflect mood, and even within a single color, there are so many different and varied shades that communicate different moods, emotions, and attitudes. My favorite color is blue. I don’t really have a reason for it, I just like it navy blue is my favorite, university of Kentucky is second. I also love navy blue stripes with white/grey/red, and sometimes yellow. 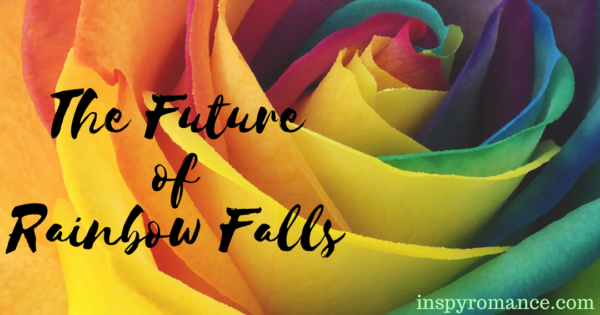 The Rainbow Falls series sounds like it’ll be fun to read! Heather, I love finding new Christian authors to read, so thanks for writing this post. Your name, Heather, is one of my favorite colors. It is so soft and lovely, and it reminds me of Scotland. Another favorite, and a color I wear very often, is aquamarine, softly combining blue and green, the colors of the sea. Loved your blog. I love blue !!! To me is calming!!. Now my husband is a gray person he loves it. This book sounds awesome. A must read. One of the funny things about being named Heather Gray is that whenever I talk about the color, I now spell it w/ the British spelling. So in all my books, even though all the grammar is 100% American, I spell grey with the “ey” instead of “ay.” I might be a *bit* of a rebel. ;) Enjoy something wonderful and blue today! Looking forward to the release of Skye in your new Rainbow Falls series. I love the color green. I have green eyes so that has made me partial to green. I also love yellow which is a fun bright color but it is not a color that I would wear. I really love yellow flowers especially yellow roses and daisies. Fun! I love how your mind works! Thanks for stopping by today Autumn!! My favourite colour is blue! My kids joke that I have an exclusive blue eyed club … They are all part of the brown eyed club! I’m not even joking when I say Heather Gray is my favorite color. I am re-decorating my bedroom in Heather Gray and yellow. I have a thing for birds and I found the perfect comforter for my bedroom. It is Heather Gray with little yellow birds. That is an adorable comforter! When you said gray with yellow birds, I wasn’t sure what to expect, but it’s nice and elegant, sophisticated yet cheerful. Good call!! Sounds like a fun series.Looking forward to reading it.My favorite color is pink . Pink was my daughter’s favorite color. (Purple was second, but pink won hands-down. Half that girl’s wardrobe was pink!) What is it about the color that you most enjoy? Your Amazon “adventure” made me giggle. I would love some great advice to make a book stand out among the other books and merchandise they carry. Also love the Rainbow Falls idea. I’ll look for it when you publish. Are you going indie? I’m considering taking that path too. Hi Barbara! I’m glad you could stop by today. :) Standing out amid the hundreds of thousands of choices out there is hard, that’s for sure! Rainbow Falls will be indie. While it’s not the right path for everybody, it’s the direction God has taken me for this series, and I’m excited about it. Blessings to you as well! The color thing made me laugh. My husband and I argue about colors all the time. What I call beige or cream, he calls white. I have to keep telling him he does not own any white pants. Lol. I love the idea of your new series. Looking forward to reading the books when they come out. Your series sounds like fun! My favorite color is pink,I’m not sure why. This sounds like a fun series. It will be interesting to see the other characters evolve. I love blue and tend to gravitate toward jewel tone colors in my clothing. Thanks Heather for this intriguing and interactive blog. After watching grandkids finally had time to read them all. Love that blue won! It is my husband’s favorite color, because he is color blinfpd and it is a color he can see. Still would love to see a color blind character. I love the color purple and all fall colors. I love mixing and matching. Ooh – I love fall colors too! They’re rich, layered, and complex. And depending on how you pair them together, they convey completely different meanings/moods. Your blog is really cute, Heather. I love a sense of humor. I also like the sound of your new series in Rainbow Falls. Can’t wait for the first book to be available! I love most colors so will enjoy finding out what you’ve named your characters.